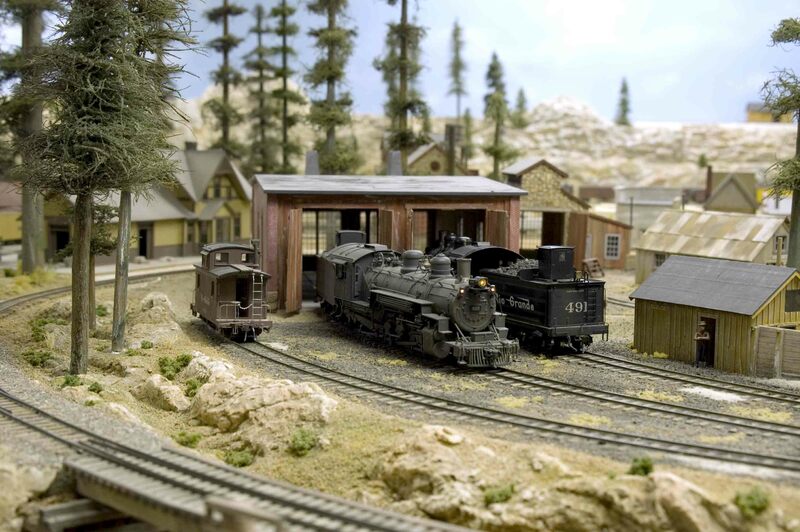 Welcome to my Sn3, "Cimarron and Tall Timbers Railroad," a 1950's imagineered Cimarron Division of the D&RGW railroad. Layout construction started in late 1995, as I decided to, "up-scale," after about two decades of running HO/HOn3 equipment. The layout is 17' x 22' and contains over 180' of mainline and about 150' of branch line trackage that is reached by a 4% grade. The main line track elevation is approximately 51' above the floor and the branch line is about 12" to 15" above the main. To eliminate having too many supporting legs in the way under the layout, "L" girders were constructed from 2" x 6" dimensional lumber and 3/4" plywood. Additional 3/4" plywood was used for risers that support the sub-roadbed made from 5/8" thick Industrial Particle Board. Beveled 1/2" thick Homasote, along with thousands of hand cut and laid bass wood and white pine ties and Rail Craft Code 70 weathered rail were used throughout. All the turnouts were constructed in place and powered by Tortoise switch machines. Two throttles are used on the C&TT RR. One is a PBL FSS-II with a RF hand controller and the other is a home-built unit featuring a Darlington transistor type that is used in conjunction with a PFM Mini Sound unit. The layout is divided into about 20 blocks with dual cabs on the main line and a choice of either of the main line cabs or a third cab for the upper level, Silver King branch. There are also two reversing sections controlled by DPDT switches on their respective control panels. Block control is also controlled with DPDTCO switches and in several locations, magnetic latching relays that can be operated from two control panels. LED's display turnout routing and track occupancy. 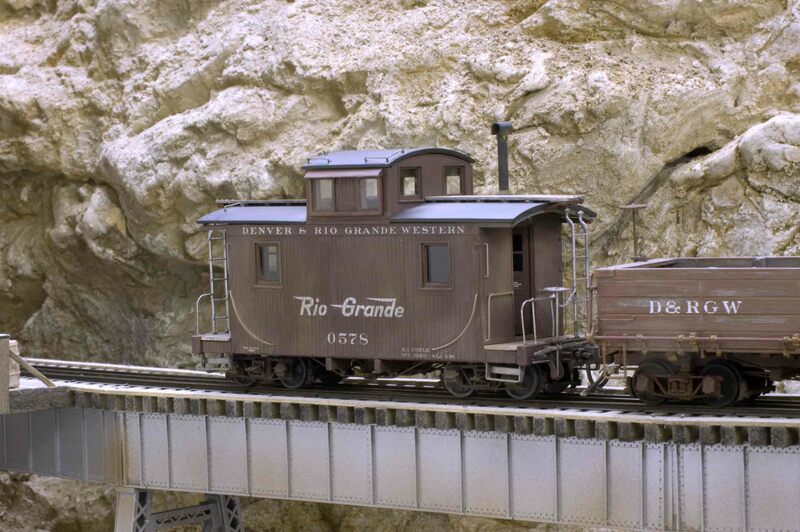 The photo of caboose 0578 was taken as it crossed my version of Lobato Trestle. The steel girder trestle is one of the first things visitors see when they enter the layout room. 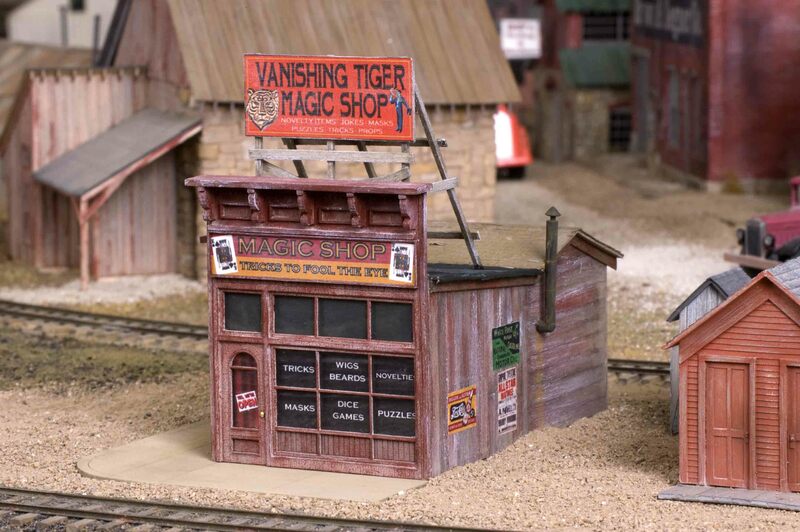 The helper engine facility at Tall Timbers features many scratch built structures, among them being the two stall engine house. The prime purpose of the complex is to provide helper engine service for trains climbing the 3% grade over Cimarron Summit. 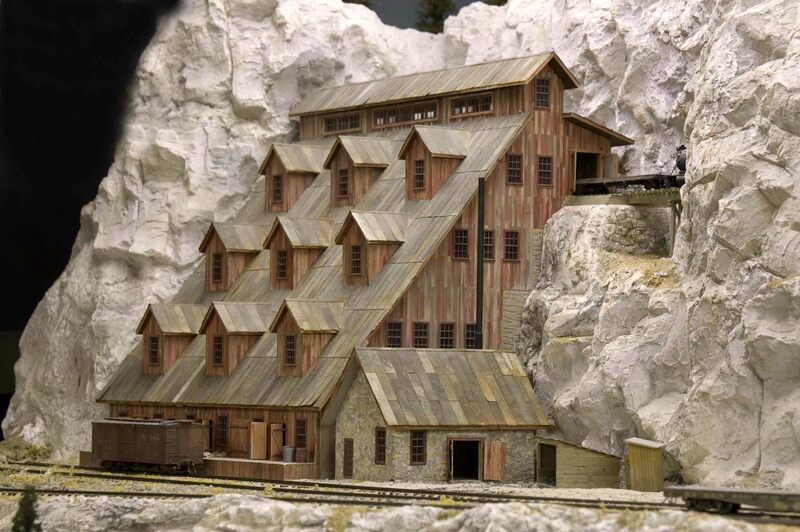 Structures include a two stall engine house, coaling tower, sand house and one storage track for a rotary snow plow. Adjacent to the engine house is a car repair shed with its associated blacksmith shop. 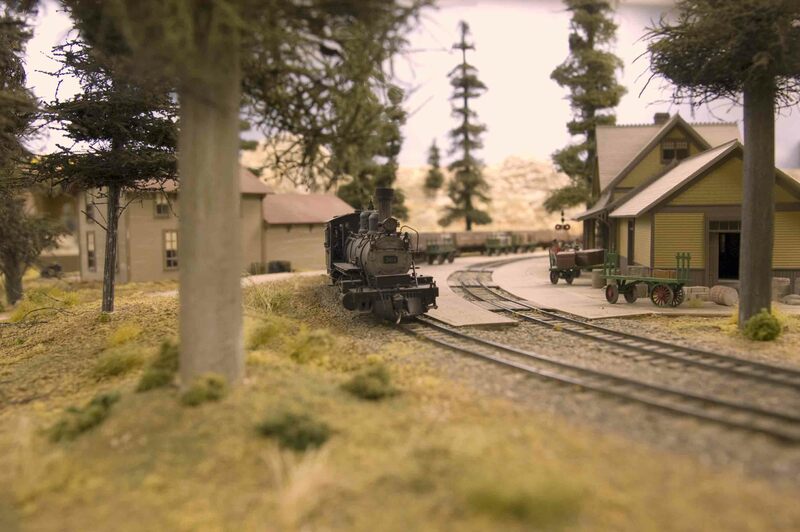 The community of Tall Timbers features an RGS type depot, similar to the one at Ophir, many stone and timber structures and a turning track for the locomotives and complete trains. 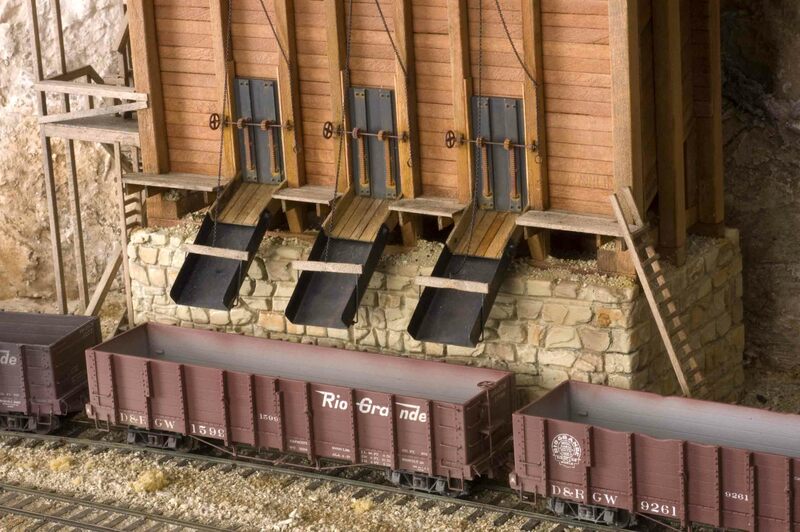 Wooden trestles and steel girder bridges are key elements on the layout. Currently there are a total of ten, but more are planned. The most impressive and the first one seen upon entering the layout room is a combination wooden trestle and open deck truss bridge that places the branch line train at eye level, about 5' above the floor. 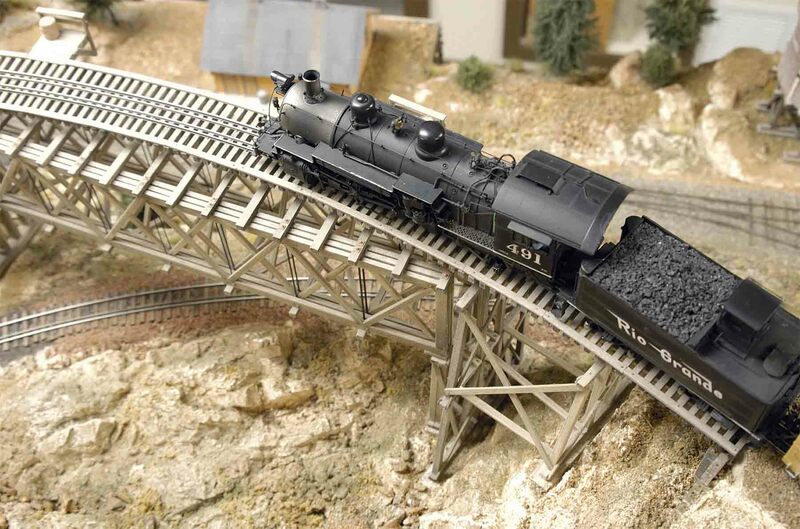 The construction of this trestle was featured in the Sept 1999 issue of Railroad Model Craftsman magazine. This, "aerial," view shows the trestle from an entirely different perspective. Most of the track has been ballasted with soil from Colorado or material gleaned from local road side rock cuts near my home. Hydrocal plaster soaked pieces of paper shopping bags were drapped over an interlocked web of cardboard strips. Additional rock details were made in home-made latex molds using dental plaster. Vegetation consists of native plants, bottle brush trees, commercially produced ground foam and dyed sawdust. While most of the buildings have provisions for interior lighting, only a few of them actually have lighting, using warm-white LED's from Christmas Tree lighting strings. It's the building that houses the main offices of the Silver King Mining, Thomas Drilling and Acme Dynamite Companies. Many of the structures on the layout have been featured in product reviews and articles in National commercial or NMRA publications or documented in construction documents on this web site. The upper level of the layout features several mines and a large milling operation. 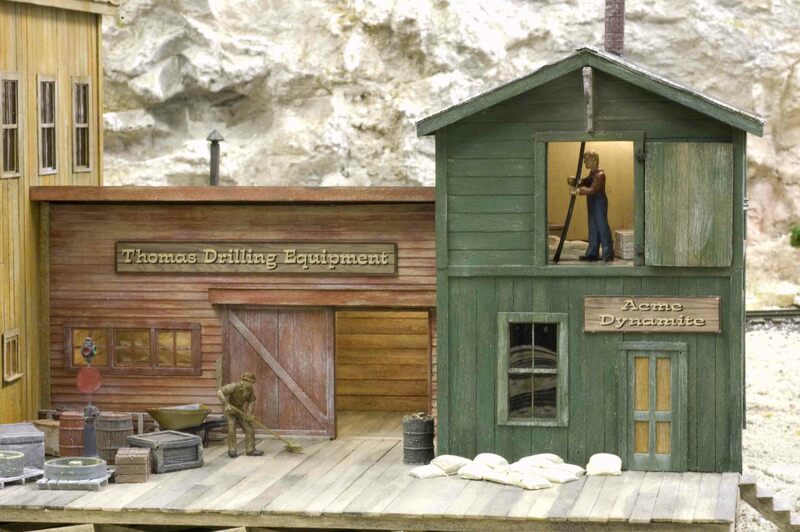 Upon entering the layout room, one of the first large structures seen is the Silver King Mill. While it's interior is empty, it appears in operation with two spur tracks for concentrate hauling box cars and a coal car to deliver fuel for the boiler. High in the corner is the ore bin of the Red Tresses Mine which features an overhead aerial tramway carrying the ore from the mine that's, "just over the hill." While incomplete at this time, it also promises to be a prime feature on the branch. A familiar sight to many is the Cimarron 1 Mine. 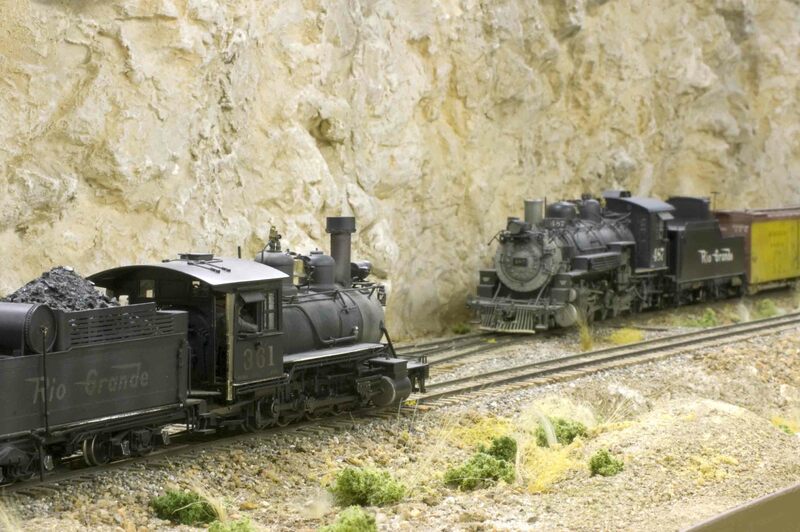 It has been produced commercially by Banta Modelworks in many scales and is based on an O scale model by John Campbell I saw while attending my first National Narrow Gauge Convention in Durango back in 1996. 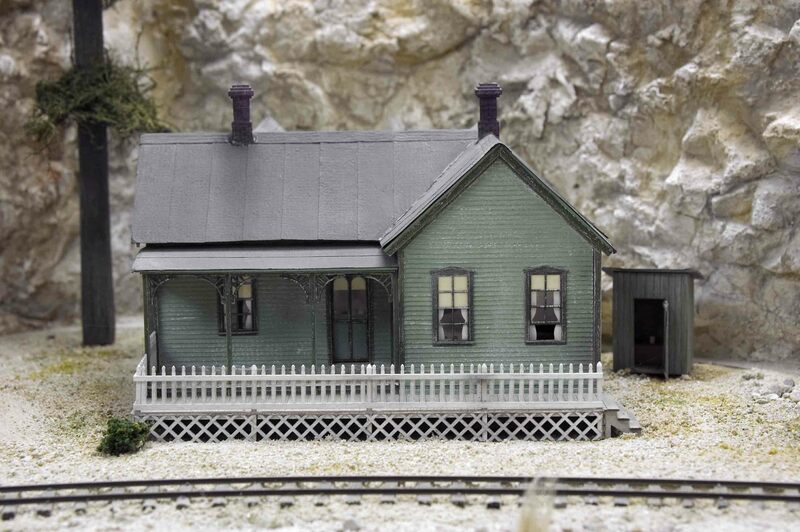 Another familiar structure on the layout is a small house based on an actual structure that once stood in Silver Plume, Colorado in 1940. I designed the original model using a photo I found on the Internet in the Western History Collection of the Denver Public Library. Again, Banta Modelworks offers a laser cut wood kit of the model in most of the major modeling scales. 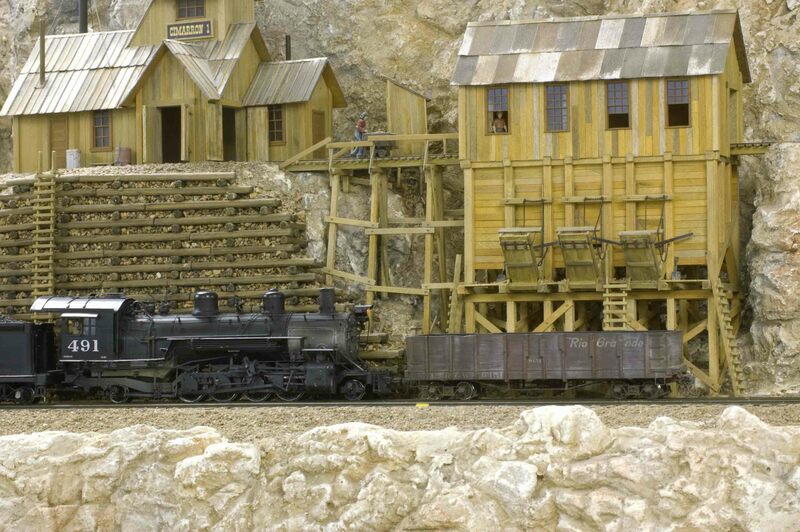 After crossing an impressive wooden trestle, the tracks lead to a small community Cimarron featuring the, "Cimarron Lead & Zinc mine and ore bunker," "Cimarron Union Miners' Hotel," a small engine house and saloon. Eventually there will be a sheriff's office and jail to handle problem miners. There's a daily train bringing at least 12 high side gondolas up from the valley below. It's pulled by two K-36 or K-37 locomotives, arranged in much the same fashion as the D&RG did on its Monarch Branch. The engines separate and remove the twelve loaded gondolas with the empty ones before pulling out of town. Twice a week, there's a short passenger train that carries the miners to the mine site and back to the community of Tall Timber.